This Premium practice exam will give you a feeling of the real IBM certification exam environment as we maintain the exam syllabus, structure and time limit same as the actual IBM C2090-930 certification exam. Random selection of questions from the premium question bank and shuffled answer options will make the practice more challenging. 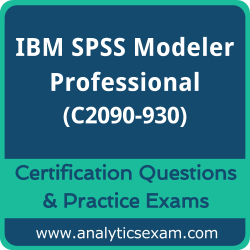 For Better Result: As we offer unlimited attempt for the IBM SPSS Modeler Professional Practice exam - C2090-930, we strongly recommend you to practice as much as you can. It will help you to identify weak areas to improve your understanding of particular syllabus topic. Continues practice helps you to score outstanding in your actual C2090-930 exam. Premium IBM SPSS Modeler Professional Questions bank contains 53+ questions. Online Practice Exam will populate questions randomly from this question bank. All the questions from premium question bank will be covered easily in 4 to 6 practice exam attempts. However the more you practice, the best will be the result in real exam.